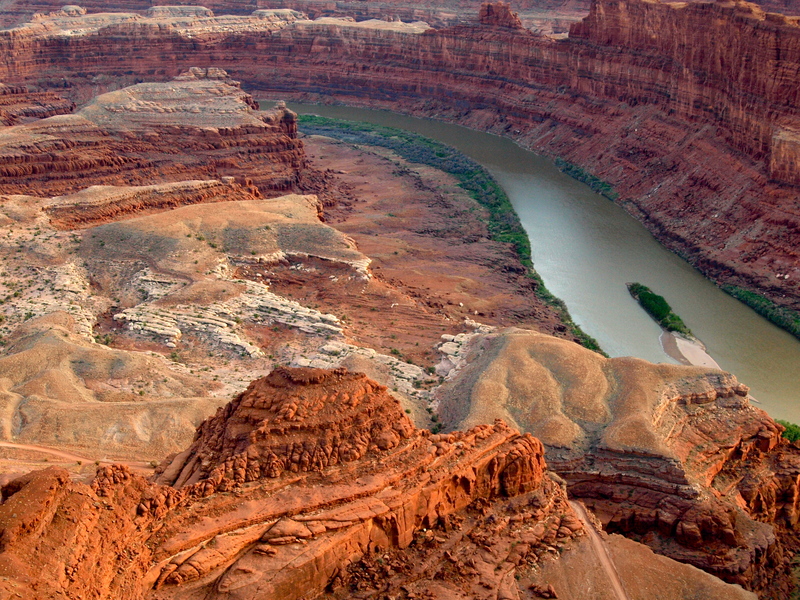 Dead Horse Point, just north of Moab and Arches, is one of my favorite places on Earth. This was the very first place I ever took a desert hike and whenever I’m in Canyon Country, it always calls me back, even on overcast days. Overcast days often make for awesome evening light! Dead Horse Point State Park is a spectacular place with a morbid name. 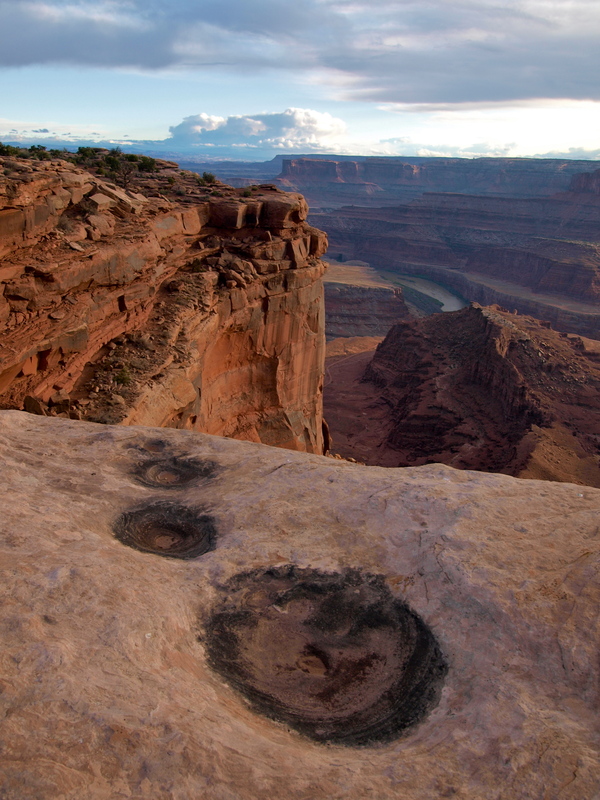 In the visitor center gift shop this past weekend (searching for a sticker for my souvenir sticker tote and a few postcards) I overheard a little girl crying and her mom asking the park ranger for help: she was worried about seeing dead horses at Dead Horse Point. The park ranger explained the dead horses are long gone. Back in the 19th century cowboys used the thin, prominent point as a natural corral, herding mustangs out to the tip and building a fence across the bottleneck of the point. Then they could pick and choose the best horses from the bunch and let the others go. 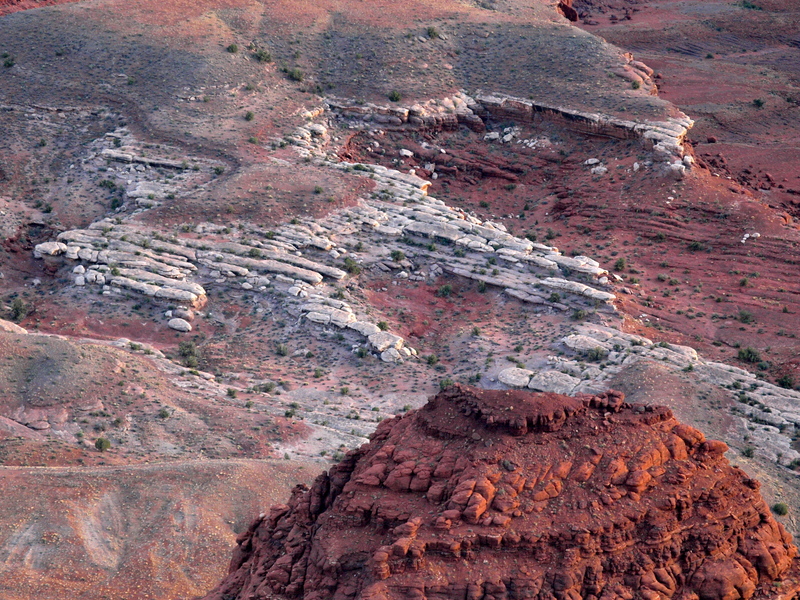 As the story goes, once the cowboys forgot to open the gate and the remaining horses all died of thirst out on the point, within view of the Colorado River below, trapped by precipitous cliffs. Sounds like a tourism ruse to me. But then the park ranger mentioned another Mormon pioneer namesake unknown to me: a white rock formation off the tip of the point that resembles a dead horse laying on its side. This I had to see. You can drive all the way out the edge of Dead Horse Point, but why drive when the walk is among the most spectacular in the Southwest. 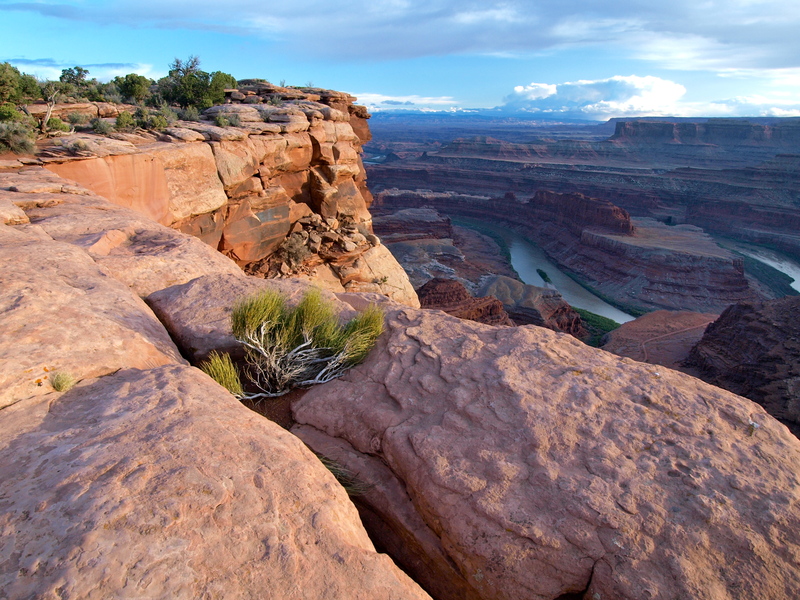 The 3-mile Rim Trail skirts the edge of the point, overlooking the meandering Colorado River, Canyonlands, LaSal Mountains, and on a clear day, most of Southeast Utah, making for one of my all time favorite hikes. I passed a few people along the short paved nature trail by the visitor center, but then had the sandy, slickrock trail to myself all the way out to the drive up overlook. It never ceases to amaze me how closely people stick to their cars! 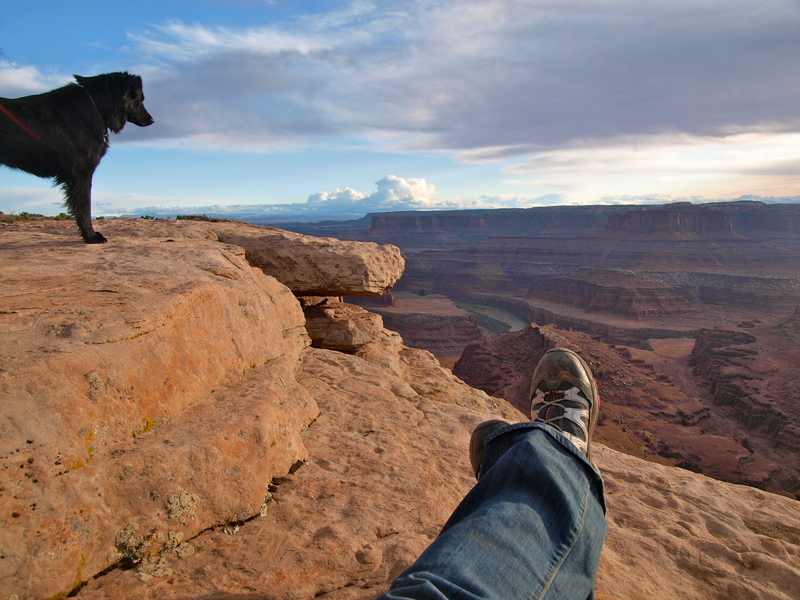 Dead Horse Point D.O.G. All of the state parks I've visited in Utah are dog friendly. 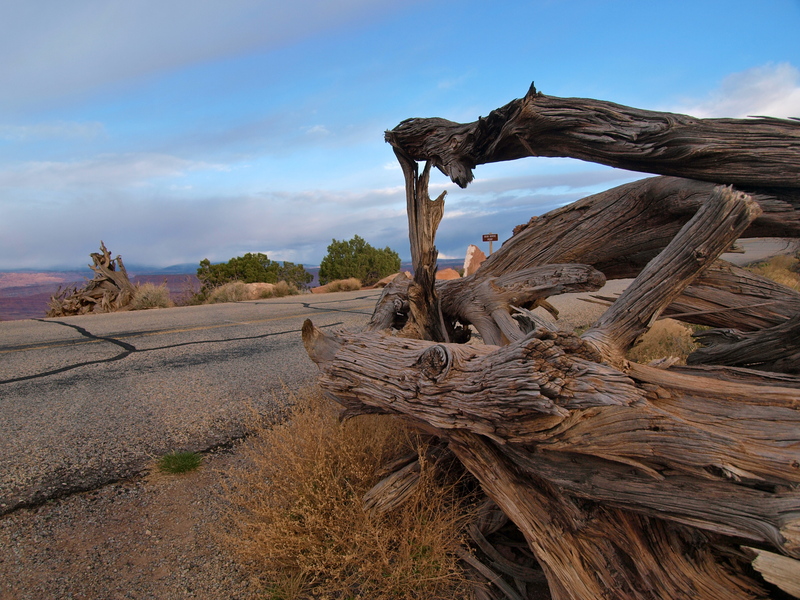 Click here for more photos of Dead Horse Point! Very nice post…beautiful photos…and nice bit of local history, too. I’m envious of your rootless journey, Mary…what a treasure of a life you have. Thank you for sharing it with the rest of us. Haha funny you should ask- I just bought a new pair of Salomon trail running shoes yesterday! The Asolos last a couple of seasons at least (love them!) but I wear out the trail runners every 4 to 6 months. It’s getting expensive! thank you so much for sharing… your photos are just a delight to sit and look thru, and your story is great! 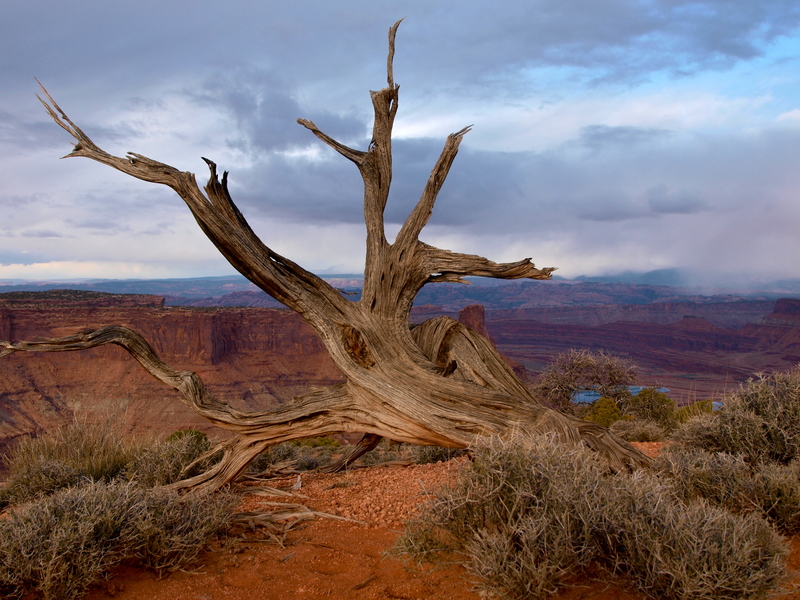 The dead juniper at Dead Horse Point looks like the view from a scene of The Unsinkable Molly Brown. Does anyone know if this is true? Man I love and miss that country. Thanks for the travelogue of great shots. Your photos are breathtaking! Thank you for sharing! We looked Dead Horse when we visited a couple of years ago. It was small and so much more personal. You have some wonderful shots here with some fantastic perspectives.